Buizen Yachts, Pilot House Yachts – The Finest Blue Water Cruising Yachts In The World. 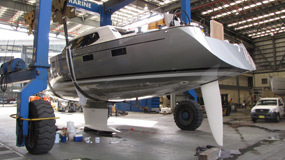 Handcrafted and custom made yachts, Sydney Australia. We advise with great sadness the passing of our Buizen Yachts founder and a true industry icon, Eddie Buizen , in early March. Few would argue that Eddie Buizen created the benchmark for the highest quality cruiser sailing yachts of the 80's, 90's and early 2000's, ever built in Australia, and many consider, in the world for that matter. His Buizen Yachts were and continue to be considered the ultimate in cruising yachts and the most highly desired amongst the Australian cruising yacht fraternity. Eddie was highly regarded and hugely respected for his contribution to the Australian Marine and Boat Manufacturer's Industry. He leaves an enormous legacy and one our industry is very proud of. His model ranges included the Zeston 40 and 36, and the Buizen 40 and iconic Buizen 48. Eddie's passion was focussed on the design and building of sail cruising yachts engineered to meet the demands of trans ocean passage making whilst cocooning it's owners in the highest quality joinery and luxury interiors. It produced a boat building standard previously unobtainable in the Australian market and quickly established a very willing domestic following. His unique Pilot House or Deck Saloon designs broke previous yacht design paradigms, and whilst they were often copied, they were never bettered. 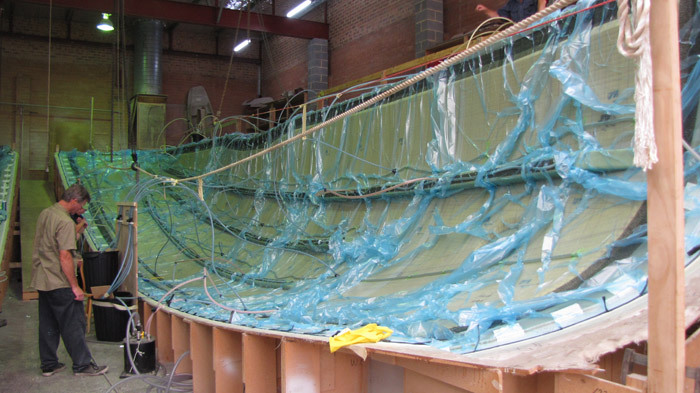 When the influx of the mass produced European yachts begun in the 1980's and increased throughout the 90's, Australian sail yacht builders began to succumb and slowly disappear. That is however with the exception of the Buizen Yacht, because the imports could never touch the design and quality of Eddie's yachts. Eddie Buizen was a true gentleman and many of his owners became his friends. His focus on building quality in every element of his boats instilled an unshakeable confidence by the owner in their yacht's capability. At the time of Eddie's retirement in 2005, he had built 80 semi custom cruising yachts for very satisfied owners. Industry Legend is a term that can sometimes be loosely thrown about, but in the case of Eddie Buizen it's a term that aptly fits. Our sincere condolences to Eddie's wife Jeanette, son Tony, daughter Tanya, brother Frits and extended family. 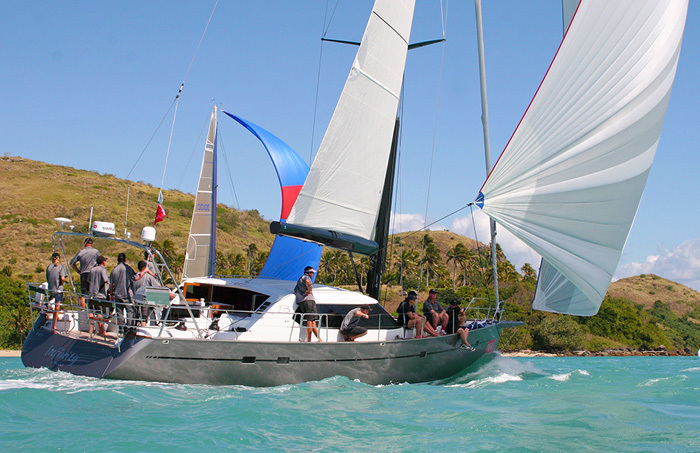 OUR BUIZEN 52 HULL 2 "INFINITY" WON THE CRUISING DIVISION WITH SPINNAKER IN THE RECENT MAGNETIC ISLAND RACE WEEK. 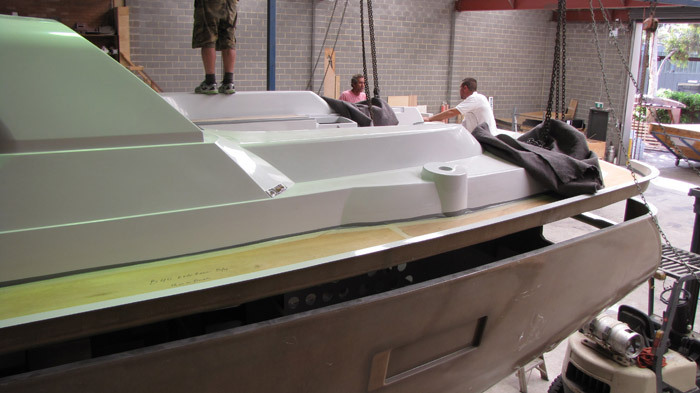 BUIZEN 52 HULL 4 HAS LEFT THE FACTORY! 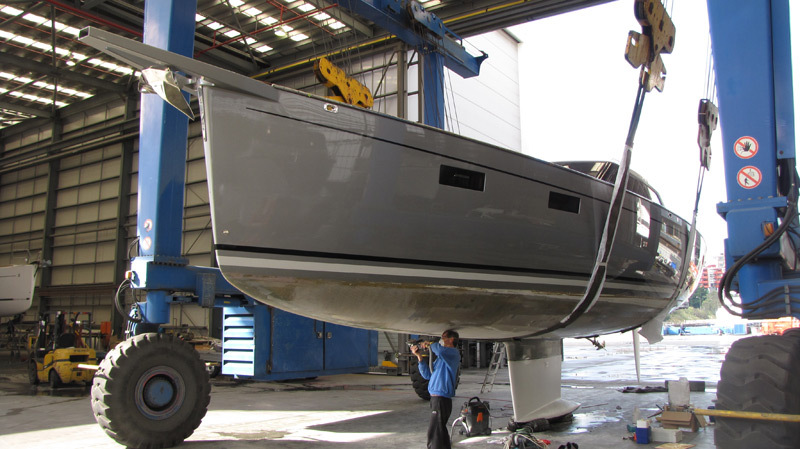 Our beautiful new Buizen 52 Hull 4 left our factory on Wednesday night for Sydney City Marine to have her keel and rudder fitted before her planned launch next Thursday. Champagne now on ice but won't be smashing the bottle against that lovely paintwork. Update : “TradeaBoat Magazine nominates the The Buizen 52 as the pick (along with 3 others) of all the sail boats tested and reviewed by their journalists in 2014. Article is featured in the Jan/Feb edition out week ending 22/1/2015.” - January 2015. Paul and Jill Carter's maiden voyage from Pittwater to Fremantle in their new Buizen 48 "Elevation"
We departed from Heron Cove Marina @ 6.53am, just as the sun was rising. There had been a spectacular thunderstorm in the area on Monday evening and the result created a humidity haze across Pittwater. Calm waters, no wind, and a little mist created a very picturesque view for our final sail in these waters (well for @ least 5 years !). A marlin was jumping in the water @ Barrenjoey Head - a new sight for all of us on board and very exciting !! 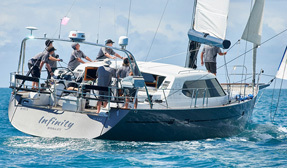 Buizen 52 Hull 2 Infinity produces amazing results at the Hamilton Island Race Week 2014 in August. Very impressive placing's over the line in all of the 6 races, plus an overall 3 rd in the Series. This clearly establishes the 52's performance credentials on top of her luxury cruising attributes. The Buizen 52 hull 3 was proudly on display at the recent Sydney International Boat Show. She was the boat of the show in most people's minds. Hull 3 of the Buizen 52 was launched today (18/7/2014) for her very excited owners. 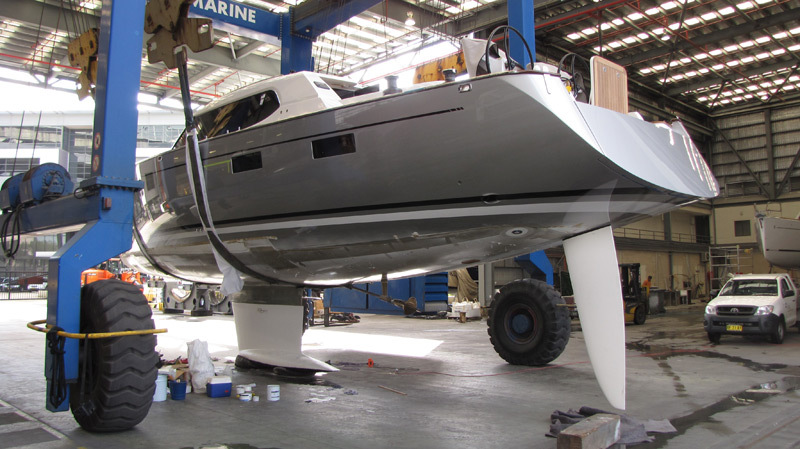 She will have her new carbon rig fitted next Tuesday and be at the Sydney International Boat Show commencing on the 31 st July 2014. On the 13/2/2014 we completed the infusing of Hull 4's Port Hull. Her QLD owners are very excited. 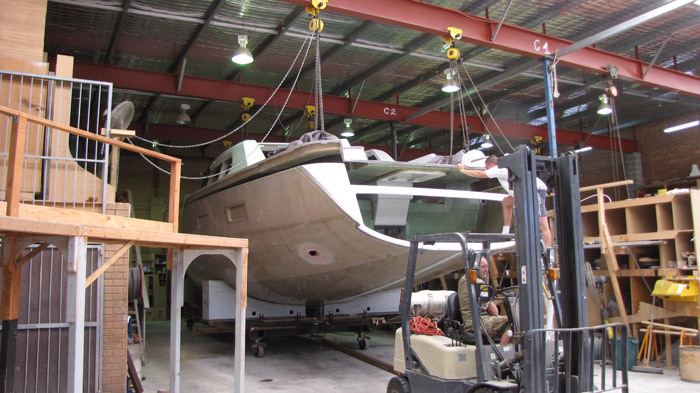 On the 7/2/2014 Hull 3's Deck was joined to her hull allowing fit out to commence. Always an exciting time when this milestone is reached. Targeting a June/July launching for her Perth owners. 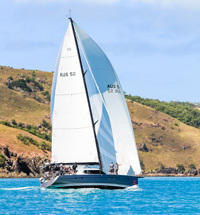 The New Buizen 52, Hull 2 "Infinity" achieves a Podium finish at Airlie Beach and demonstrates superior speeds at Hamilton Island Race Weeks 2013. 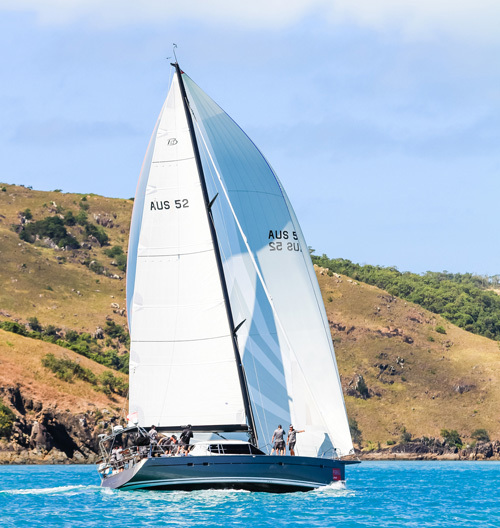 Airlie Beach Race Week (10 th to 16 th Aug) and Hamilton Island Race Week (17th to 24th August) saw the racing debut of the New Buizen 52 in the form of the dark silver Hull 2 of "Infinity". To say her debut was impressive is an understatement. The Buizen 52 "Infinity" was entered in the Cruising Division 1 of both regattas, fleets which included the famous maxis "Condor" (80'), and "Hammer of Queensland" (76'), "Whitebirds (ex Bobsled") Steinman 73', "Storm 2" (Warrick 66' by Azzura Yachts), "Eureka 11"(Sydney 60'), "Salacia"a J60, a couple of ex admiral cup boats, plus a large fleet of the European production yachts inc Jenneaus 53/49/42 and Beneteaus 57/55/54/50, Bavaria 55, a Hanse 54 and Dehler 41 plus an Oyster 65. All up a Division 1 fleet of 12 in Airlie and 21 in Hamilton Island. Certainly a fleet against which the new Buizen 52 could be measured. In simple terms of Boat speed, the Buizen 52 was close behind the maxis and bigger boats (in some races finishing only seconds or a few minutes behind), competitive with the ex admiral cup boats (having beaten them over the line in a few races)and completely dominated (finishing well in front in nearly every race) the similar sized or even larger European production boats (inc the Oyster 65). With the exception of Hamilton's Race 5 which was plagued with a fickle breeze, a tidal current lottery and almost abandoned, she always finished 6 th or 8 th (out of 21) over the line at Hamilton Island, making her the most consistent boat in the fleet. As one crew member on one of the production yachts said " she seemed to be in another race class than we were ", "Infinity" 's owner is thrilled saying ". she just sails away from them ". Unfortunately for "Infinity", the PHS Handicap System in these regattas attaches higher ratings to the faster boats to give the slower boats in the fleet an opportunity in the overall or Series Point Score. From a handicap perspective, the Buizen 52 was consistently given the 7th or 8th highest handicap in the fleet of 21 boats after the maxis and bigger performance boats at Hamilton. Her handicap was significantly higher than the similar or larger European production boats in the fleet. Her results are even more impressive given both regattas were hampered by light winds. 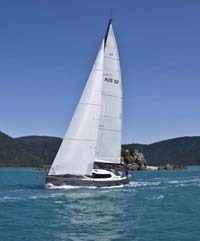 Having led the overall Point Score at Airlie going into the final race, Infinity was awarded 3rd Place in her Division 1 at Airlie, and similarly, having been placed 2nd in Division 1 at Hamilton Island Race Week after her 2nd Race, Infinity acheived 9th in the Overall Series scores for the regatta. Dockside, the beautiful lines of the Buizen 52 were getting plenty of attention too. Steve Howe, Director of Buizen Yachts says "..naturally like her owners, we are thrilled with the Buizen 52's race results at Airlie and Hamilton Island Race Week . 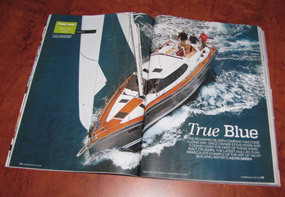 From the first sail of Hull 1 in Pittwater, we knew the Buizen 52 was a quick boat. The 52 was designed to be a luxurious blue water cruiser like all Buizen Yachts, but with the speed and performance to be very competitive in the major Divisional Race regattas around the country or overseas. 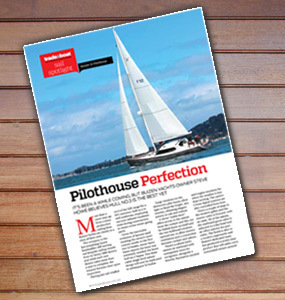 The boat speed and the performance of "Infinity" at Airlie and Hamilton Island Race Weeks has certainly proved just that ". 13th February 2013 and our 2nd Buizen 52 took to the water under sail for the first time. She absolutely flew and recorded 10.6 knots SOG down wind and 9 knots to Windward in 15 knots of breeze- and that's before we started to tune her rigging. Click here for more pics. The 2nd Buizen 52 was launched the week before xmas and is currently undergoing finishing touches before handover to her excited clients. She will be then sailed to her new homeport in Tasmania. She sports a beautifull gun metal silver hull, a Rosewood and Walnut interior and a full carbon rigg. For further information or an inspection please call Steve Howe on 02 9450 2170 or mob. 0410 557 454. It is with great excitement that Buizen Yachts announce that the Windcraft Group under their new division eYachts are now the exclusive Agents for Buizen Yachts both in Australia and the rest of the world. Windcraft/eYachts MD Mr Peter Hrones and Buizen Yacht's Steve Howe shook hands on the agreement in principle at the Sanctuary Cove Boat Show in May 2012. Howe appreciated that Windcraft is Australia's fastest growing, most dynamic and largest new Yacht Broker with offices in Sydney, Melbourne, Brisbane, Perth and Auckland. Windcraft's stable includes Hanse, Moody, Dehler, Fjord, Greenline, and Dragonfly. Hrones created eYachts to support his existing and potential new clientele who were considering the premium yacht brands, Buizen Yachts is a perfect fit. 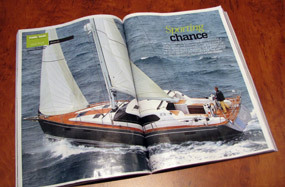 "Windcraft's success is due to Peter Hrone's vision and leadership, defined by his ability to choose and position his brands and influence their design features to satisfy his market's expectations and needs" said Howe. Howe continued "Peter has simultaneously invested heavily in a comprehensive after sales support team to look after his customer's every need thus creating a "Windcraft Family" where trust and relationship loyalty is a distinguishing feature. Windcraft's wholistic approach has now caused many of their clientele to rule out dealing with any other yacht sales company. This network of support and expertise will benefit all new and future Buizen clients and includes Windcraft's comprehensive used yachts brokerage division who manage all trade-in stock. The ensuing coming together and relationship building between Buizen and the Windcraft/eYachts team has been effortless, and enjoyable. We are all excited by the partnership between Buizen Yachts and the Windcraft/eYachts Group". 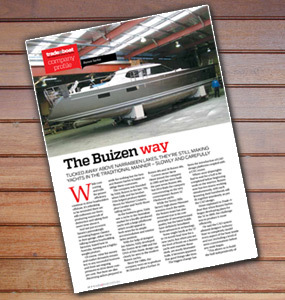 Hull 1 of the very first Buizen 52 was unveiled at a Factory Function held on May the 16th. Close to 70 invited guests attended where after a short ceremony the covers were dropped to reveal her modern superstructure lines and dynamic hull shape. All were subsequently invited on board to inspect her innovative deck and cockpit layout, and the spacious interior layout of this very impressive new model. It was a sensational night, and all now look forward to her launching later this year. Anthony Starr Yacht Design has been engaged by a number of name boat manufacturers and private clients to produce designs for new and refitted yachts. In recent years Anthony had been engaged by Warren Yachts to produce the designs for the S77, S87 and S120 Sports Yachts which were all subsequently built and achieved industry recognized awards. Employed by Greenline Yacht Interiors and based in Dubai for most of 2010, Anthony worked as the Design Co ordinator for a number of super yacht fit outs in production including the 50m "Trinity" in the US and the 60m " Coco " by Lurssens. 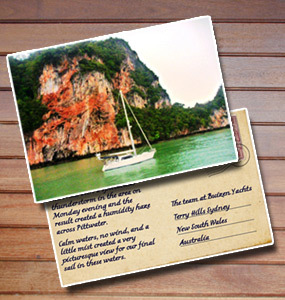 Anthony also consulted on yacht design projects in Hong Kong and New Zealand for Greenline during this period. 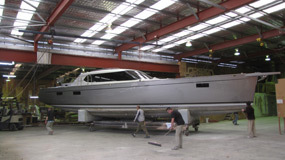 Anthony had previously been retained as the designer of the new Buizen 52 in 2009 when design works initially started. In conjunction with the Naval Architects Peter Lowe and Will Hardcastle, Anthony was responsible for the superstructure, cockpit and deck layout of the 52 and has since been creating the interior arrangements and internal design of the 52 using sophisticated CAD 3D Modelling. On returning from Dubai , Anthony commenced the construction design drawings for the 52's interior fitout in late 2010, and we were thrilled when Anthony agreed to join Buizen Yacht's full time team as our Chief Designer and Fitout Co ordinator on the new 52 in March 2011.